Some bettors will always prefer the online casinos that have a reputation formed over decades of being reliable and well-known. They turn to the likes of Coral, Betfred and Bet365 rather some of the newer companies that have sprung up since the development of the online gaming industry. Still, there are a number of excellent ‘young’ casinos that can provide you with a truly exciting and fun experience, if you’re willing to let go of any dependency on the household name bookmakers whose casinos you might have used in the past. Kerching! Casino is a perfect example, having only come into existence in recent times but already offering punters something a bit different from the norm. We’ll tell you more about Kerching! Casino’s colourful company history later on, but for now the most important thing you need to know is that it’s owned and operated by Nektan Limited, who have flooded it with close to 400 games, and that you’re going to want to check it out. Nektan’s website declares that they work with more than seventy-five brands, which tells you everything you need to know about the sort of casino software providers you’re likely to come across when you join Kerching! The main players here are NetEnt, IGT, Microgaming, Yggdrasil and NextGen, and that means some quality gameplay. It’s such a shame, then, that there is virtually no useful way to distinguish between the near 400 games these industry titans have pooled together. Not even a Live Casino button. You will have to work the search bar hard on this site as they have done nothing intuitive or innovative with their search capabilities. The ability to create a Favorite’s list is their only saving grace. Whilst Kerching! 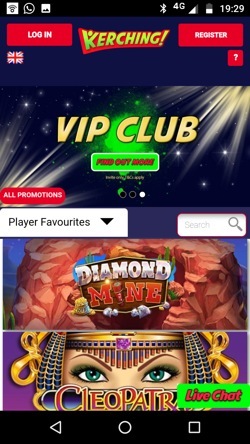 Casino’s site didn’t start life in HTML5, it has been making the transition over to the newer format in recent times. As a consequence, you’ll find that the majority of Flash content has been removed and the speed of the site will improve accordingly. The look and feel of the site come straight out of a superhero comic – even the logo looks like one of those ‘Kapow!’ title cards from a Batman adventure. It’s bright, it’s vibrant, it’s loud. They have pulled it back just enough to stop it from feeling overwhelming or annoying, though, which shows good judgement. Still, cartoon fans will definitely feel at home here. Slots – As with many other casino’s, Kerching! Is Slot heavy, and with some cracking titles too. Flaming Fox and Jungle Books are a couple of newbies, while veterans Cleopatra and Rainbow Riches also hold their own. Live Casino – Evolution Gaming to the rescue with around 25 live games for you to sample. Dreamcatcher seems to be gaining popularity and more than enough Blackjack and Roulette variations too. Table Games – There is something of a dearth of Table Games we’re afraid. To put it another way, if you don’t like playing live then there is virtually nothing for you here. 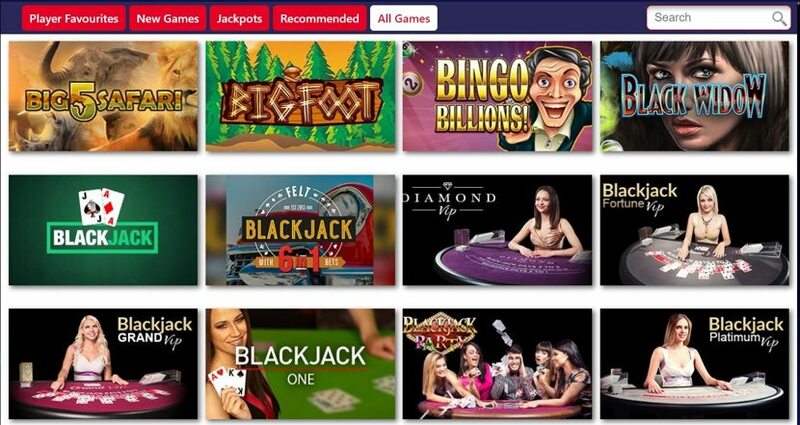 Jackpots – The only category with its own useful tab. 14 big money pay days lie in wait including Golden Goddess and Top Cat. That shift over the HTML5 that we mentioned before, combined with Nektan’s declaration that they take a ‘mobile first approach’ means that the mobile site is one of the best in the business for what is a relatively small online casino. The mobile site is essentially an optimised version of its desktop counterpart, with much of the same functionality and losing none of the vibrancy either. When it comes to mobile gaming nowadays, of course, the majority of companies have a fully functioning app. Certainly Kerching! Casino was no exception to this rule, offering a decent enough application that basically acted as a download casino for your mobile device. Sadly, this was recently taken offline and there is no word as to when it might be reinstated. Back to the mobile site then, and the bad news is that functionality doesn’t have the same wow factor as the comic book graphics. It’s a bit stodgy in places. However, roughly half of the game content is still available, although it’s no easier to split them up, but they do play well. All in all, Kerching have had a good go with their mobile site, delivering something that is better than average but saggy in places. Kerching! Casino don’t make it particularly easy to find out the information you might want to know about things such as banking. Nevertheless, a quick look around the Support section will fill you in on all of the important details. You can deposit and withdraw money in all of the usual methods, including debit cards, credit cards and e-wallets like NETeller and Skrill. You can also use Boku, though that will incur a charge of 15%. We mentioned in the intro that there was an interesting story to tell when it came to Kerching! Casino’s history and we weren’t lying. The casino has been moved from one owner to another over the years as different parent companies have been bought out or taken over. It all started in 2007 when it was part of the Million-2-1 portal, only for that to be bought by IGT the following year. 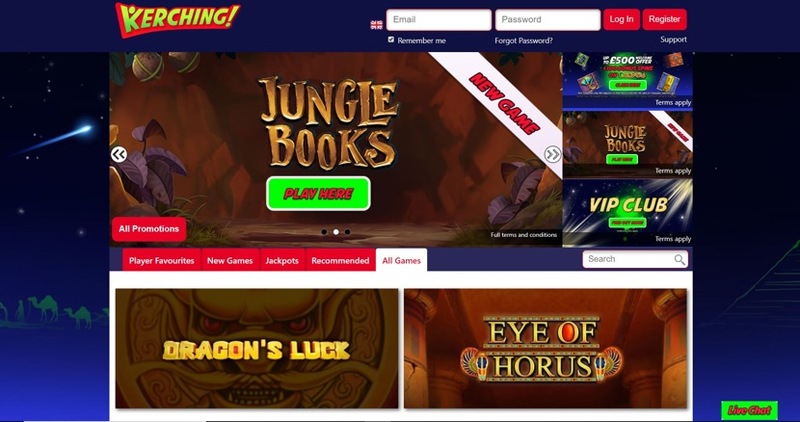 The takeover by IGT saw a number of the company’s own slot games come on to the site, with things ticking along quite nicely for a number of years. In 2012 IGT took the decision to merge Million-2-1 with WagerWorks, then two years later a company named Kerching Gibraltar Limited came in to buy it. Kerching Gibraltar Limited had a parent company named Nektan Limited, who are responsible for a number of what they call ‘White Label Casinos’. Nektan is the major brain behind the Kerching! Casino operation, taking responsibility for everything from gaining a licence for casinos through to working with more than seventy-five brands and fifty-plus partners. In terms of contacting Kerching! Casino, they’re actually significantly better at it than even some of the bigger casinos we’ve reviewed on here. For starters, there’s a decent Frequently Asked Questions section that covers most of the important topics, although you will have to scroll through it until you get lucky as it isn’t searchable. Sometimes, though, nothing beats communicating with an actual human being, and the phone line allows you to do just that. If you’re shy you can opt for the Live Chat instead which is well staffed and offers a good friendly service; although you don’t get the operators name, everyone is called Customer Support which makes things a little impersonal. Both services are officially available 8am – midnight seven days a week, but that’s not necessarily true according to our experience. Naughty naughty. E-mail is another option and there is even a fun Twitter account so they have all bases covered. We didn’t find much in the way of negative press online either which speaks volumes for the casino and their support team. Live Chat – Easy to locate from the ever present neon green Live Chat tab. If you want answers, and fast, this is the place to come. E-mail – A quick message sent to help@kerching.com will usually get a response within the hour if sent at a reasonable time. Phone – Dial 0161 669 9000 and you will speak to a real life human being. A lot of casino’s don’t offer phone support so this is great to see. 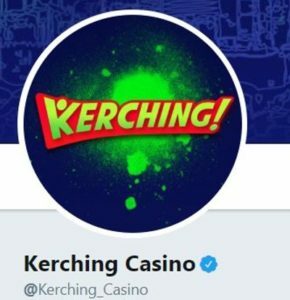 @kerching_casino – The account post regularly so while it’s not technically a support service there is someone at the other end. Address – 2/1 Waterport Place, 2 Europort Avenue, GX11 1AA, Gibraltar. Click here to visit Kerching!